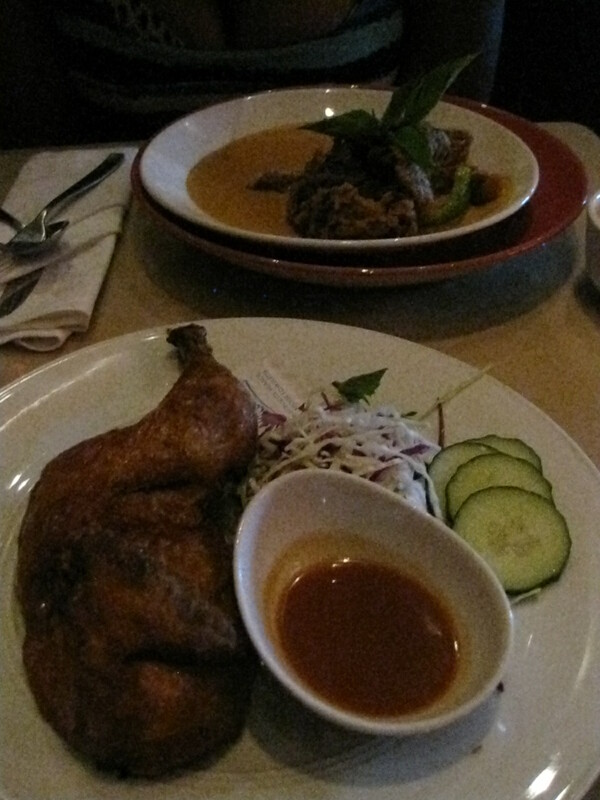 This past Saturday, I went with a friend to eat lunch at Banu. 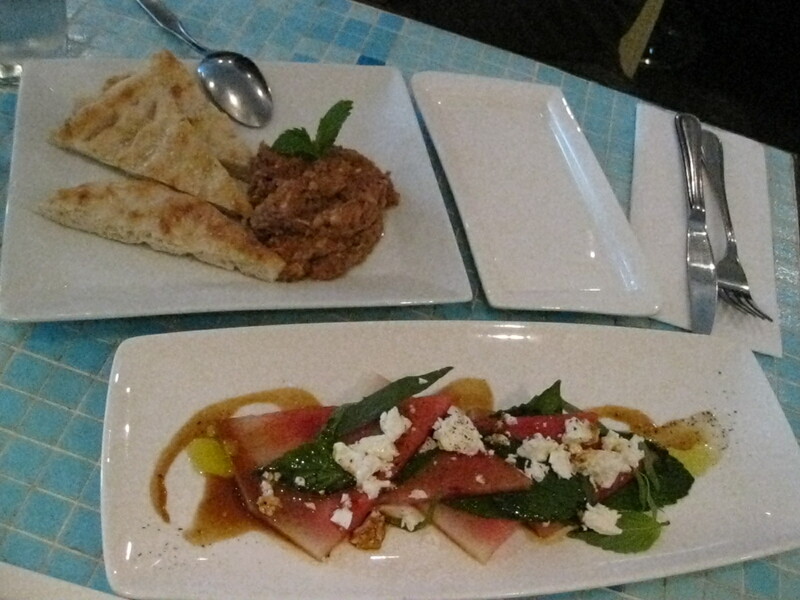 Neither of us had Iranian cuisine before and I felt that their Summerlicious menu priced at $15 would be a good deal. 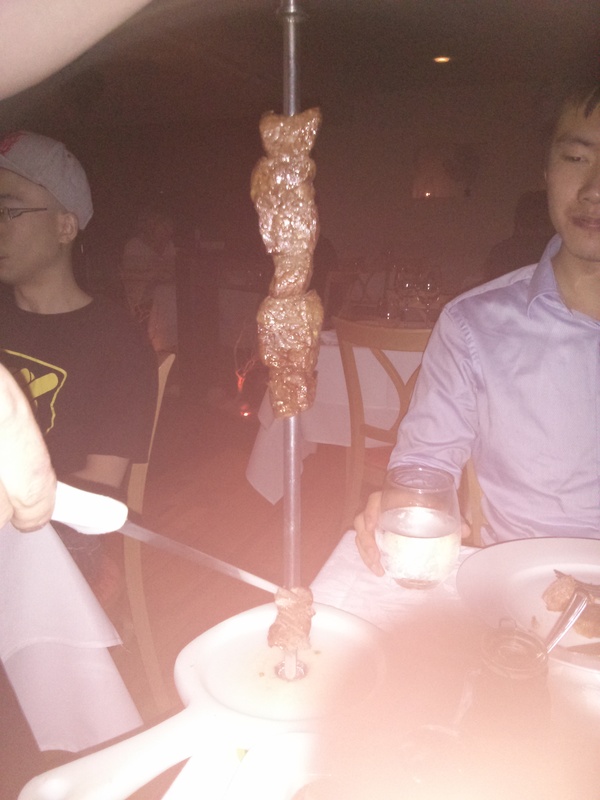 After my experience with Rodeo Brazilian Steakhouse, I was slightly apprehensive about what I would find at Banu. There’s a patio at Banu however it’s tiny. 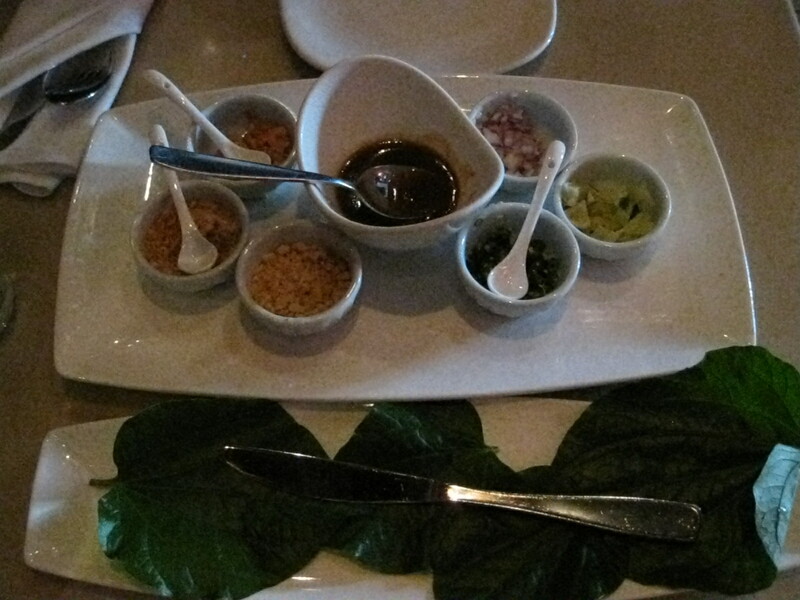 At Banu, the appetizer, main course and dessert each have 3 selections and you can choose one of each. My friend and I decided to split two appetizers because we both wanted to try the same two dishes. We had Mirza Ghasemi ($13 on their regular dinner menu) and Salad e Hendevaneh. 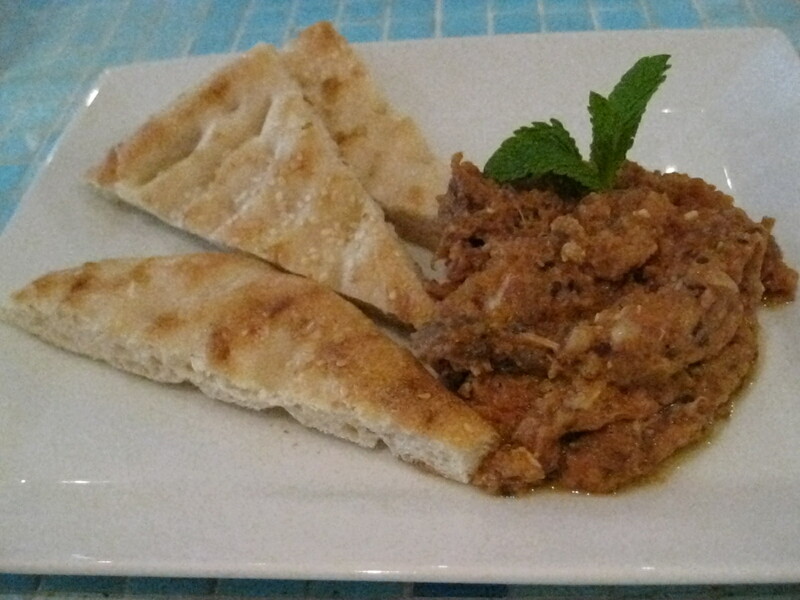 Mirza Ghasemi is smoked eggplant, roasted tomato, garlic, and egg with negella seed barbari bread. Salad e Hendevaneh is watermelon, sheep’s milk cheese, mint, basil, and olive oil. 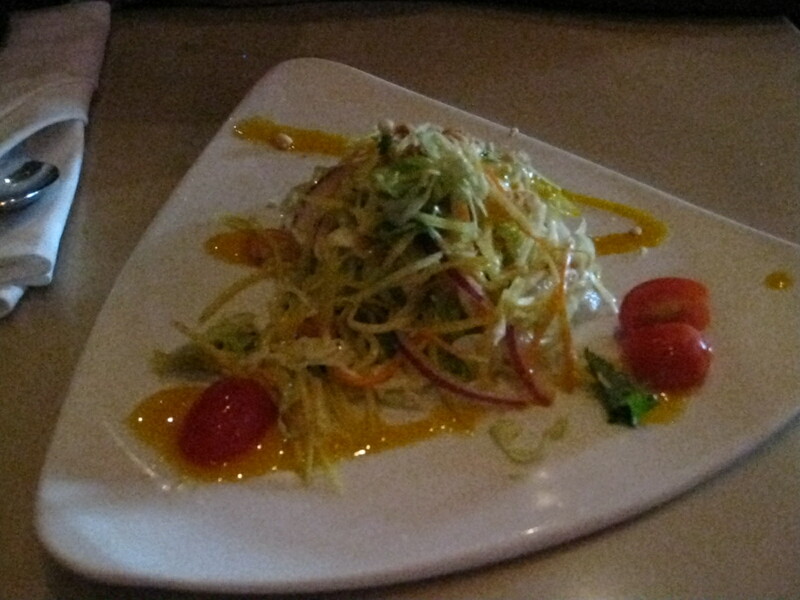 The Salad e Hendevaneh is interesting. The watermelon isn’t as ripe as I would like it and the sheep’s milk cheese is quite salty however overall combination is quite good. My friend and I both prefer the Mirza Ghasemi. It’s very delicious! For the main course, my friend and I both ordered the same thing, Kabob e Koobideh ($19 on their regular dinner menu). 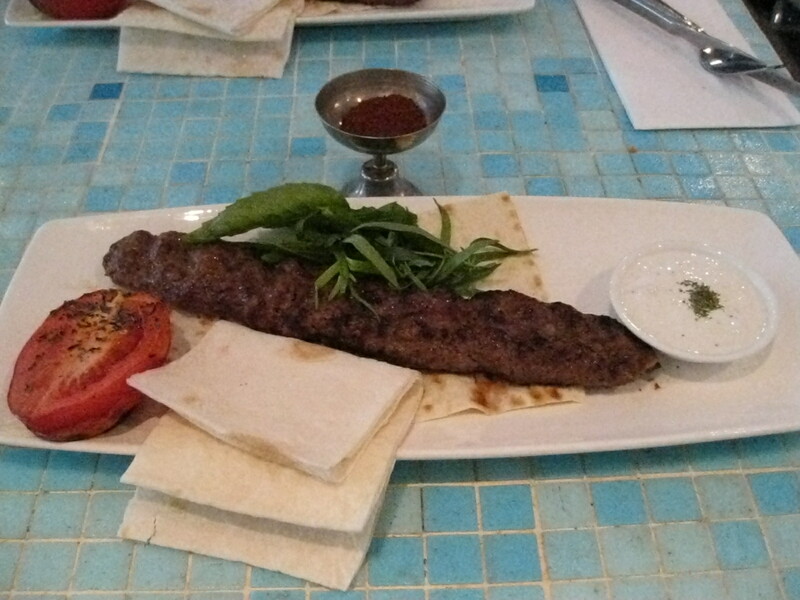 Kabob e Koobideh is grilled organic Angus sirloin kabob, roasted tomato, fresh herbs, lavash flat bread with yoghurt. You would take a piece of the flat bread, cut a piece of the kabob and roasted tomato and put it on the flat bread and put abit of herbs, yoghurt and spices on it, wrap it up and eat it almost like a roll or mini-wrap. It’s delectable! For dessert, my friend ordered Bastani ($7 on their regular dessert menu) while I ordered Paloud-e ($7 on their regular dessert menu). 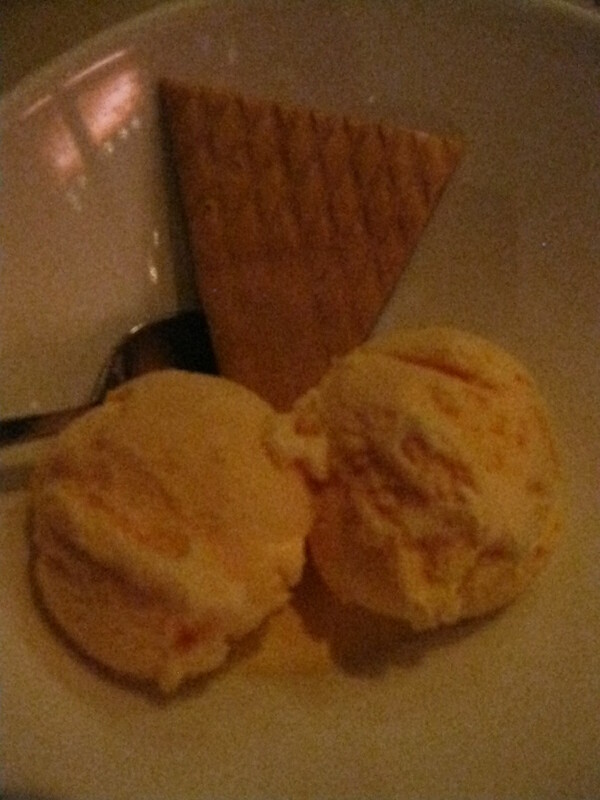 Bastani is saffron, rose water and pistachio ice cream. The ice cream itself had pistachio nuts in it rather than it being pistachio flavoured. 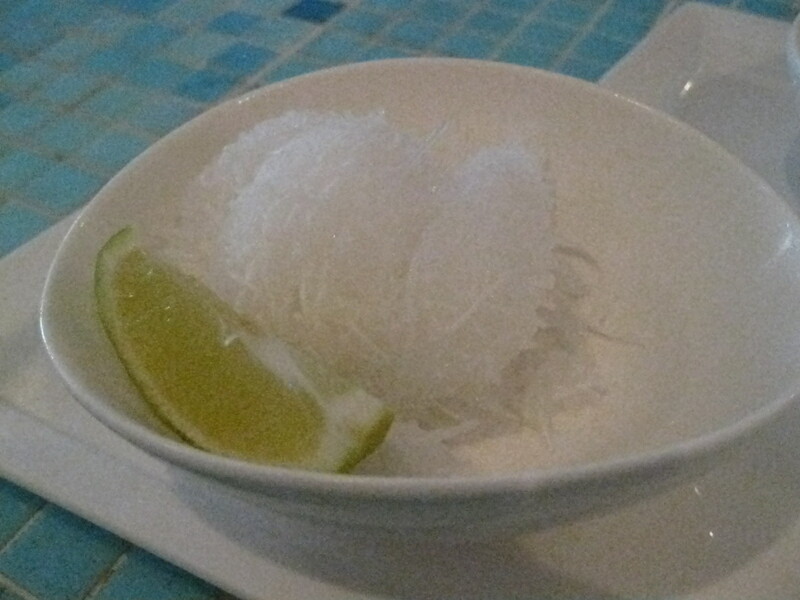 Paloud-e is rose water and rice noodle sorbet with a slice of lime. Both the Bastani and Paloud-e were very interesting. 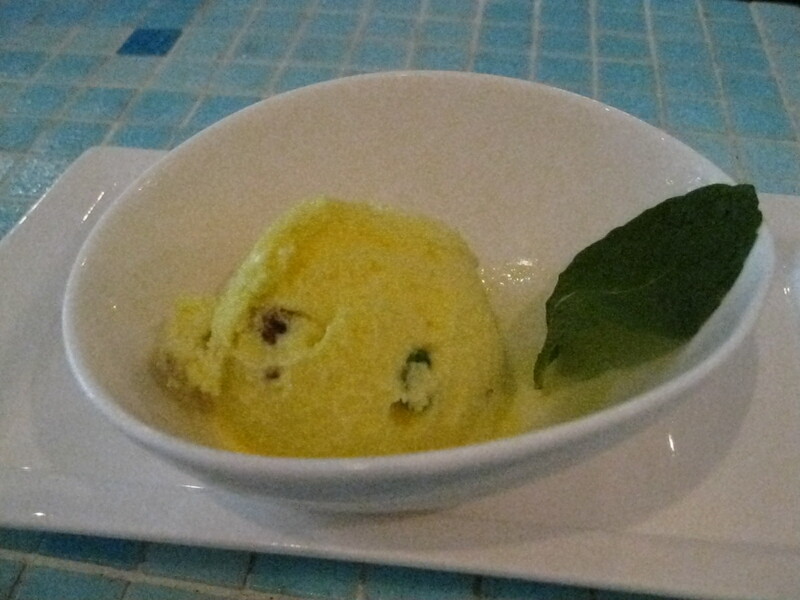 I barely tasted the saffron and rose water when I tried abit of my friend’s ice cream. The Paloud-e is good except that at times the sorbet was frozen so I would have to chip away at it with my spoon. I was slightly apprehensive about rose water since I had Bandung in Sinagpore and Malaysia and I didn’t like it. 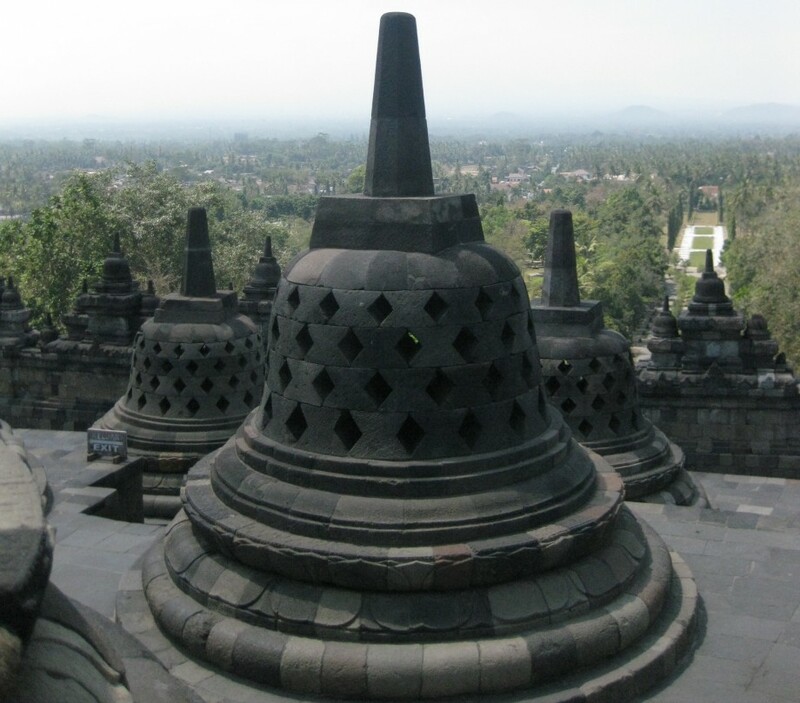 Bandung is rose water. However I enjoyed the Paloud-e. The rice noodle was an integral part of the rose water sorbet and it was interesting since I never had anything like it before. Squeezing the lime all over the sorbet added a nice dimention to it. 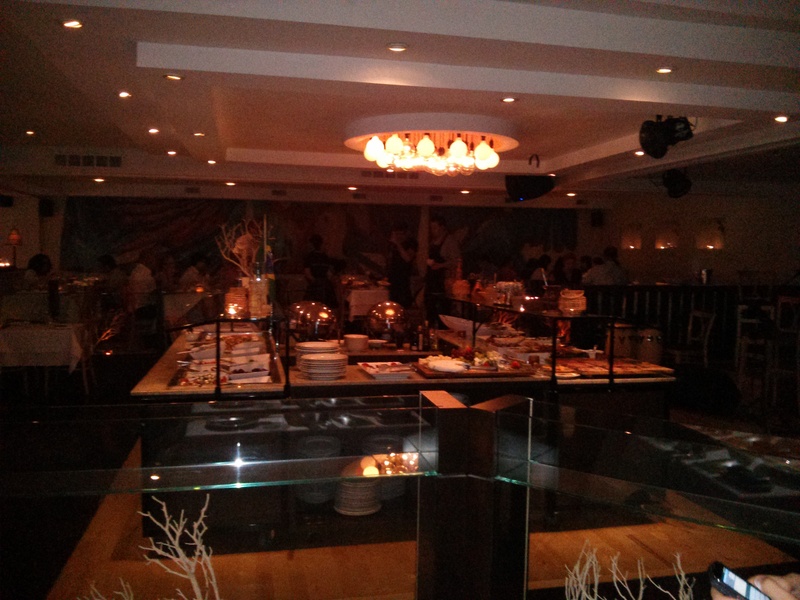 Overall, I really enjoyed my experience at Banu. 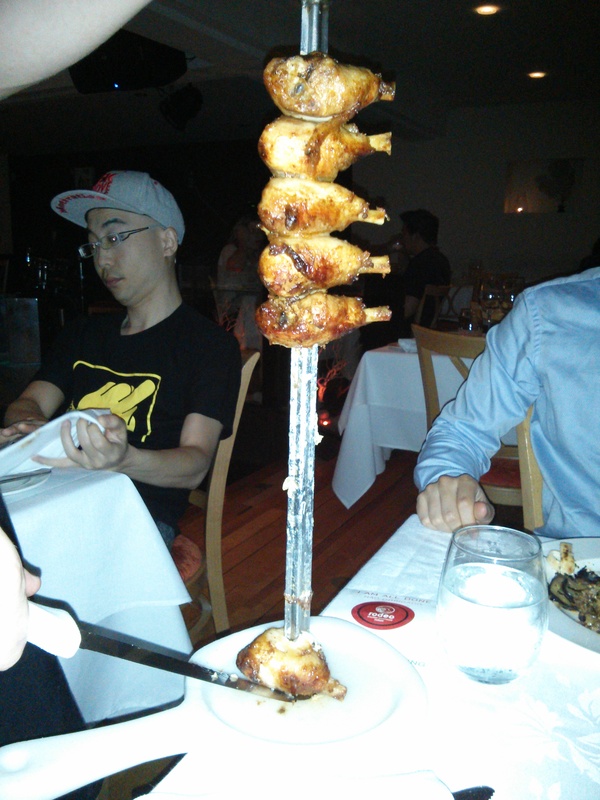 The food is delicious, for the most part, and it was definitely interesting. The service was good. They give you a fairly high quality napkin to use. The decor was nice. I liked that the table was tiled, it’s unique. The bill was $15+tax. I liked that I was able to choose the amount of tip I could give. One thing you should note is that their credit card machine automatically gives tip at 20% and you can’t change the percentage and you can’t even adjust the amount. My friend and I both paid in cash so it wasn’t a problem. 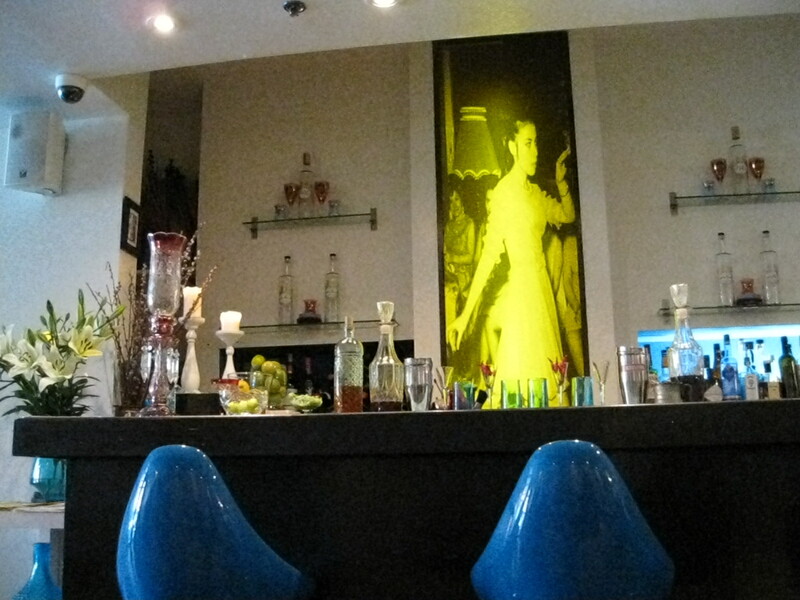 I would recommend this restaurant if you want to try Iranian cuisine. This year is my first time participating in Summerlicious/Winterlicious. 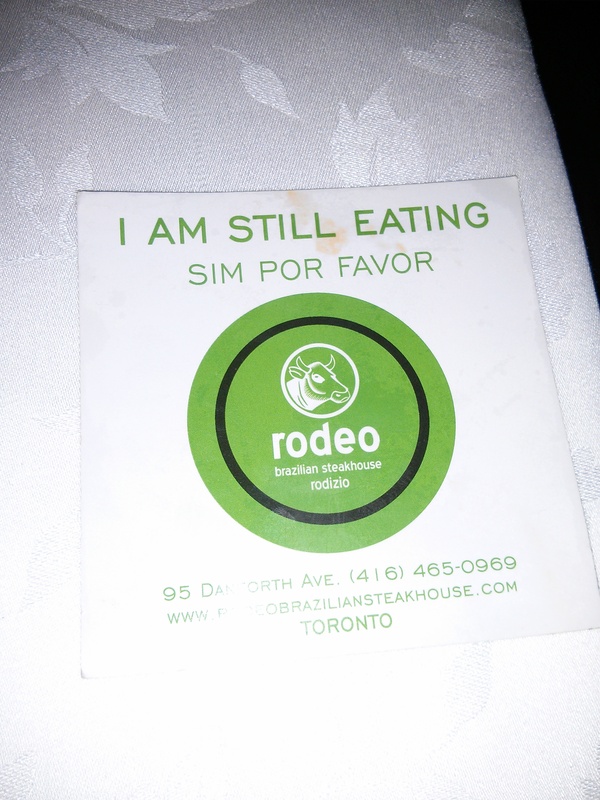 My friend and I decided to go to Rodeo Brazilian Steakhouse because we never had Brazilian cuisine before and the buffet price for Summerlicious is $35 as opposed to the regular price of $40/50. We went last Wednesday night. The decor was ok, however the lighting was on the dim side with tea lights providing most of the light in the room so the room had a nice ambiance. The meal consisted of appetizers and the main course. The appetizers were all at the square buffet tables. 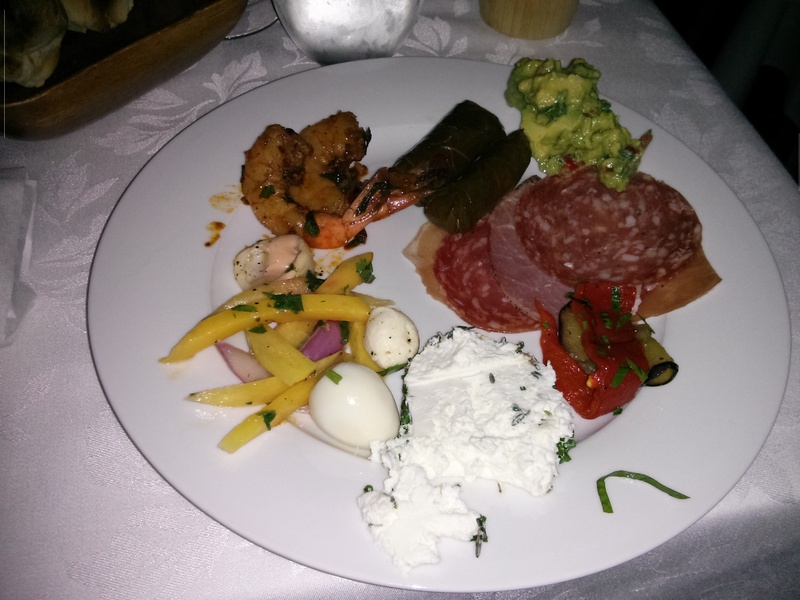 There was mango salad, guacamole, shrimp, brie cheese, goat cheese, deli meat, salad, among other things. I was going to get some brie cheese however I noticed alot of flies surrounding the brie cheese so I decided to give it a pass. 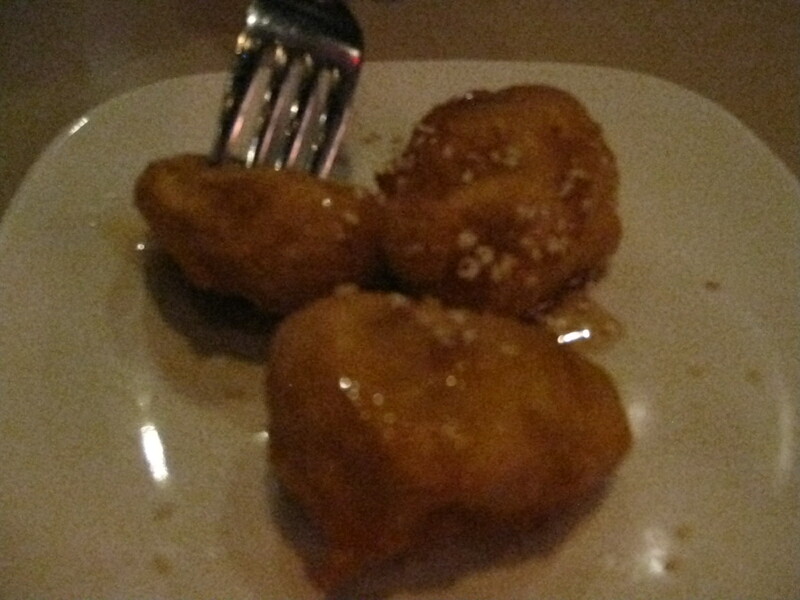 On the whole, the appetizers were ok. 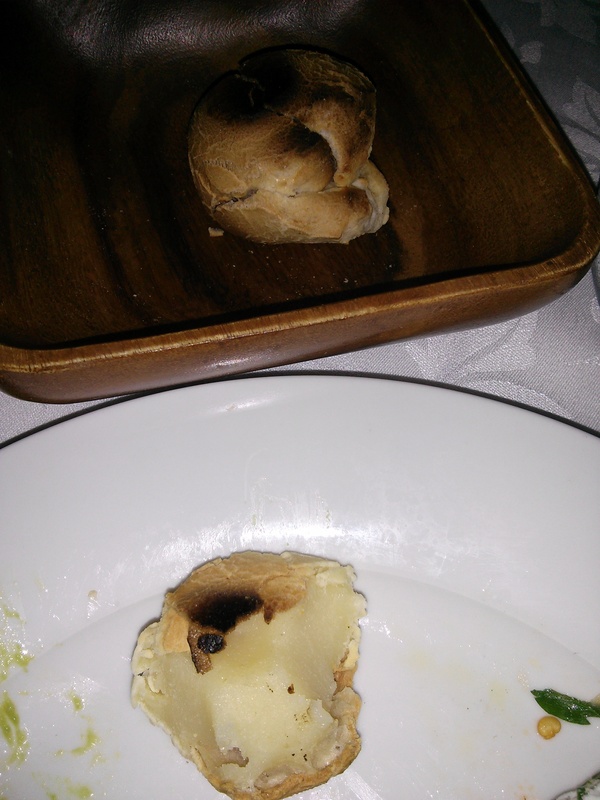 The side dish to the appetizers was this small bread encasing cheese. I liked it however my friend wasn’t a fan of it since he’s not a huge fan of cheese. After we were done eating the appetizers, we told our waitress that we were ready for the main course and if we could have the green card. The green card lets the servers know that you are ready to eat the selection of meats and pineapple while on the flip side is the red card which lets the servers know that you are full and you no longer want to be served. 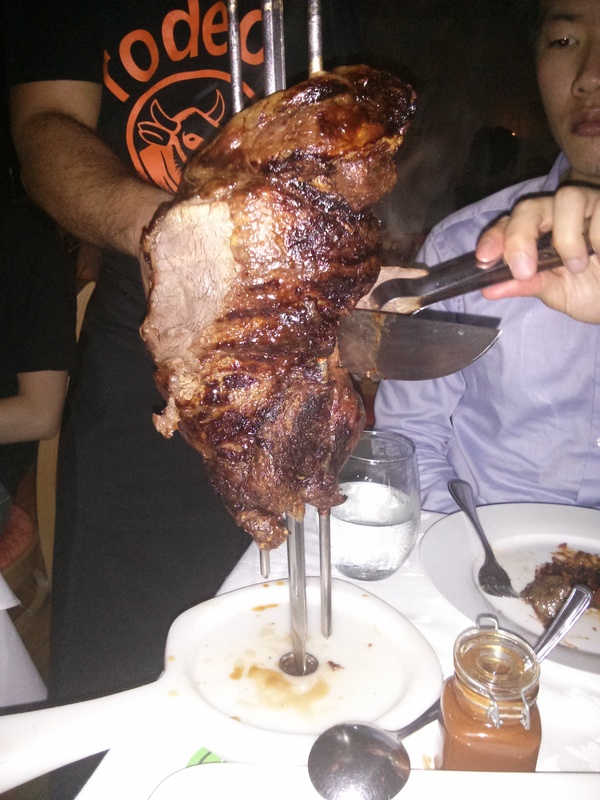 On the website, it says that there’s salmon, leg of lamb, beef rib, lamb chops, turkey breast with bacon, picanha steaks, chicken hearts, among other kinds of meat. 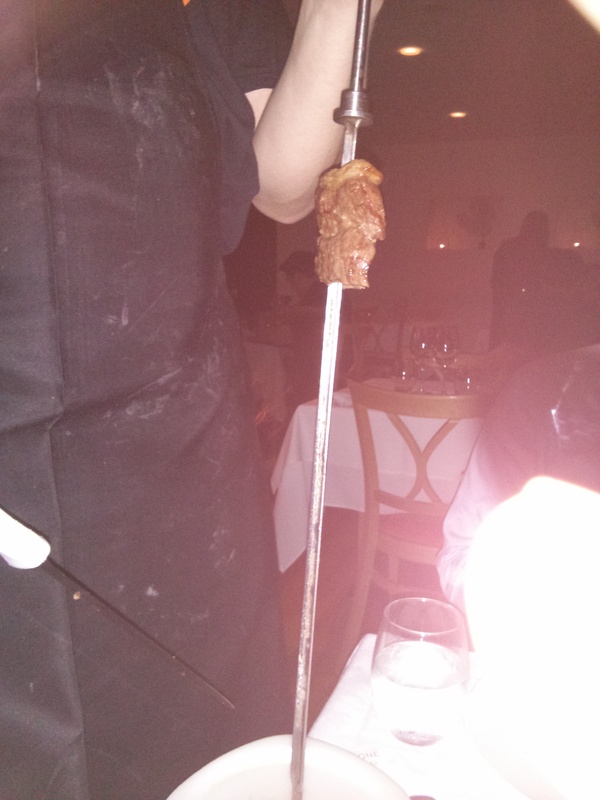 The aforementioned meats weren’t served at all. 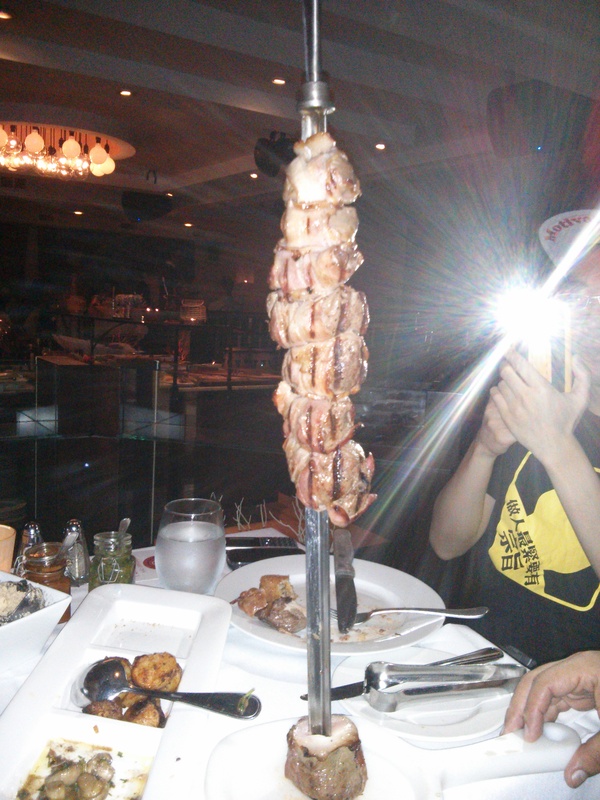 Instead my friend and I had alcatra, picanha signature cut, ribs, porchetta, rodeo sausage, beef with garlic, rodeo steak, filet mignon with bacon, chicken legs, pork loin with parmesan cheese and roasted pineapple. 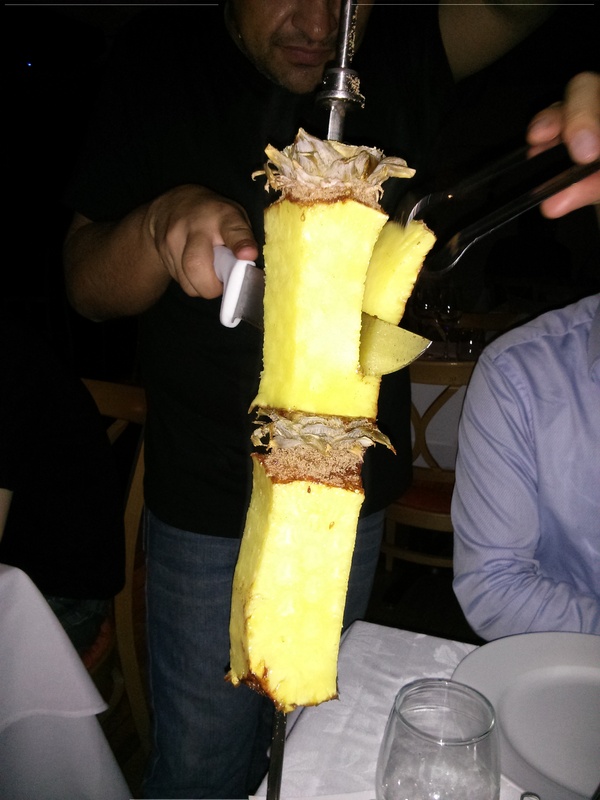 I enjoyed the pork loin with parmesan cheese and the roasted pineapple. The others were ok. Most of the beef was tough, salty and flavourless. I added alot of relish-like condiment to the meat to make it flavourful. The side dishes to the main course included mushrooms, potatoes, fried plantains, beans with rice, a relish-like condiment and bbq sauce. I really enjoyed the fried plantains and the beans were rice were alright. My friend didn’t really like any of the side dishes. We both really enjoyed the roasted pineapple. If possible, get the pineapple with the skin. The skin is dusted with cinnamon so it gives it a nice little kick and the pineapple itself was very juicy. My friend and I had a few slices of the pineapple each. The Summerlicious menu says that there is dessert which is cheese and fruit which could be find at the appetizer buffet table and it also mentioned Brazilian cake. When my friend and I asked our waitress about the Brazilian cake. She said that there was an extra charge for Brazilian cake. 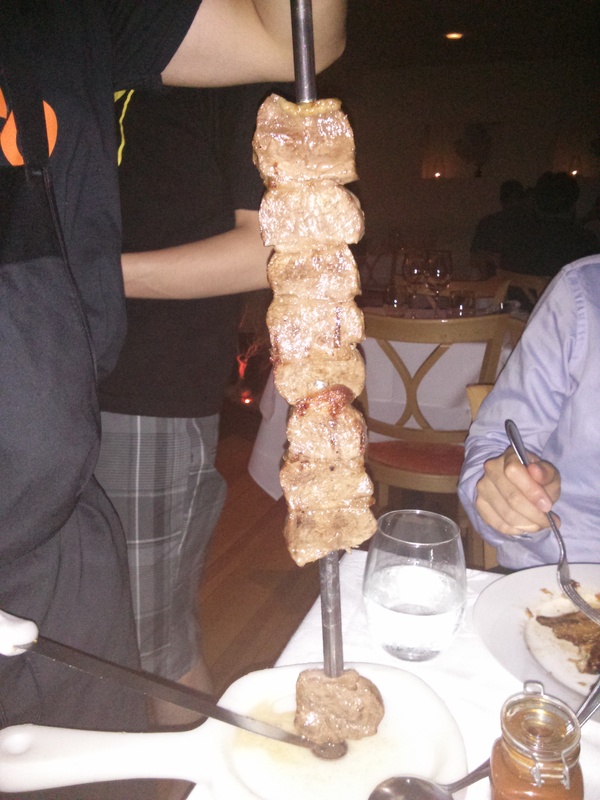 My friend and I decided to forgo it although I was looking forward to trying out the Brazilian cake. 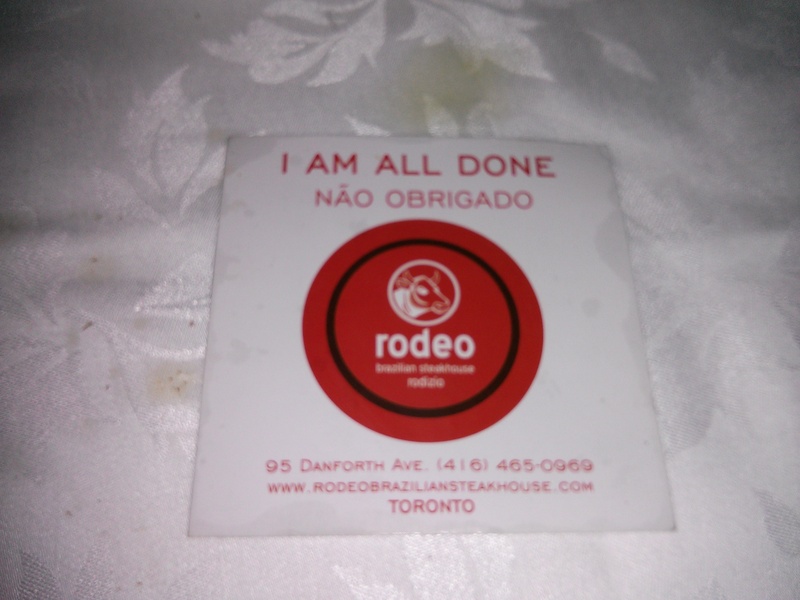 Overall, our experience at Rodeo Brazilian Steakhouse was subpar. The waitress was nice however it took a long time for her to change my friend’s plate from an appetizer plate to a main course plate, give us our side dishes, give us the green/red card, change my plate, and get the bill. She would ignore us when we tried to get her attention. It took the people beside us nearly an hour to get their bill. Meanwhile the couple on the other side of us found raw meat and it took them a while to be able to flag down the waitress to tell her about it. I didn’t like the fact that the waitress automatically added a 17% tip to the bill. She said that the Summerlicious menu automatically means tip and tax are automatically added to the bill. When I said that the tip was more than 15%, she said that it was 15%. My friend told me to calculate tip with the tax added onto the $35 and it was 15%. To me, tax and tip are charged on the grand total of the food price not the total of food and tax. I also didn’t like that the tip was automatically added to the bill at such a steep percentage when I felt that the service I received doesn’t warrant a 17% tip. 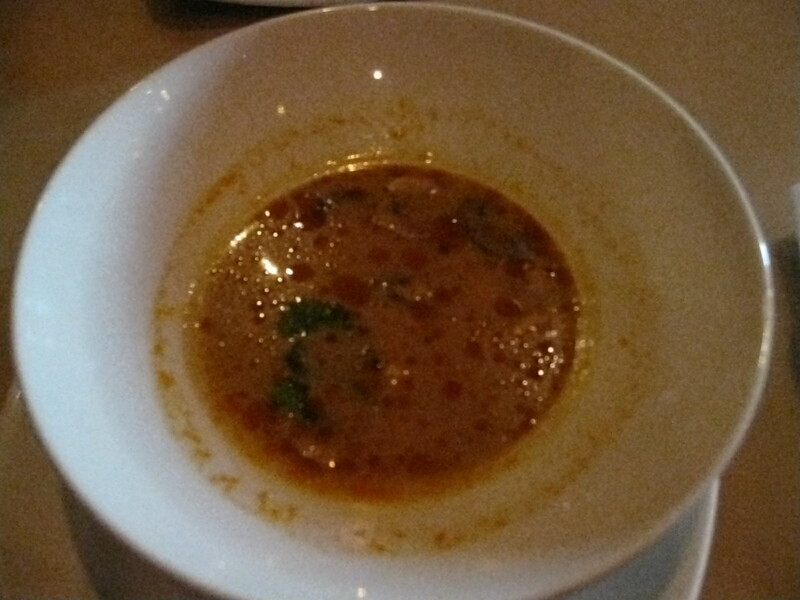 The grand total made it so that any discount you’d get from eating their Summerlicious menu was completely mitigated. There’s barely any difference eating their Summerlicious menu compared to their regular menu. 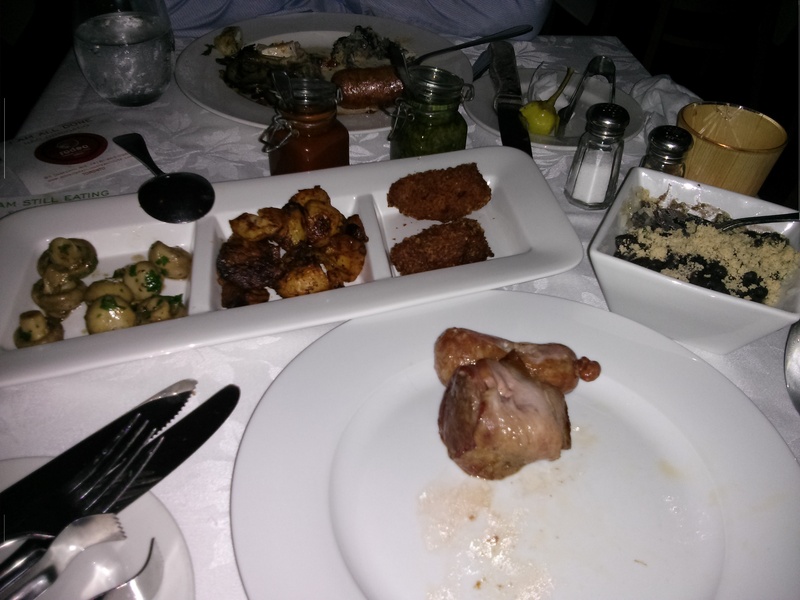 The food, aside from the roasted pineapple, the pork with parmesan cheese and the fried plantains, wasn’t worth the price of $35. I wouldn’t recommend eating here unless you want to try Brazilian cuisine.